CrossFit has become a North American fitness sensation, and here are the top reasons why you should go CrossFit this year to reach your fitness goals. CrossFit has become a phenomenon across North America, Europe, Australia, and all over the world. If you're wondering what's so great about this storm which has taken people over with a vengeance, we've got 8 top reasons why you and others should give it a shot. With the rise in the popularity of CrossFit, the organization began holding competitions where WODS are given, and people can register to compete in their region and qualify in national and international CrossFit Games. These games allow anyone to compete, and the better your numbers, the higher level you may compete at. If you are competitive by nature, this is a great way to find the motivation to stay fit and work hard. Many people find it difficult to maintain steady fitness regimes, but with CrossFit, the motivation is much higher when there is something at stake – including your pride. The nature of CrossFit's 'workout of the day' training sessions are always a challenge. Even the best athletes who use CrossFit regularly can benefit from each session. Improving strength, endurance, power and aerobic capacity by performing the full workouts in the designated time. The workouts are set up so that the participant has an objective to reach within a given time frame. The better the participant gets, the more repetitions they will be able to perform. The goals are always changing, and emphasizing a particular training quality, keeping the workouts a challenge, no matter what. 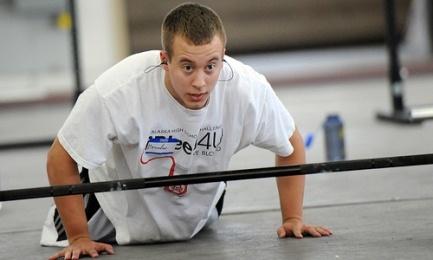 CrossFits workouts are continuous, and always push you to your max. Heart rate goes way up, and stays there throughout the workout. Since the workouts are based on getting as many reps as possible within a time frame, intensity is very high. This leads to a huge number of calories being burned in a very short period of time. If your goal is to lose weight with a comprehensive program, then this is a great way to go. With the intensity of each session being so high, the heart suddenly learns how hard it has to work to allow your muscles to do what it needs. The heart is trained at pumping harder and faster than ever before, and the lungs become more efficient at exchanging oxygen. Together, the body is able to send more oxygen to the needy muscles, thus improving cardio health. This is a great way to reduce the risk of developing cardiovascular disease, especially as we age. The last point to make here is that anyone can do CrossFit. The training is designed to fit anyone. Even though we've mentioned here how challenging it can be, it was designed to first teach participants the correct, proper technique of each movement. This ensures a safe and fun environment where everyone feels they can go at their own pace. Using lighter weights and fewer repetitions to start helps this adjustment process while still giving you a good idea of what you'll be up to in the subsequent months of CrossFit Training. Are polar hearthrate monitors any good? What’s your favorite weight loss motivation quote?